Home » church of christ , comic books , cults , hypocrisy , james oldfield , johnny robertson , mark mcminnis , martinsville , marvel comics , micah robertson , spider-man , wgsr » "What Does Spider-Man Say?" Many egotisticial nutcases in history have had pastimes. Fidel Castro almost made it as a professional baseball player. Charles Manson wrote songs. Even Hitler painted roses. And apprently local cult leader Johnny Robertson of the Martinsville Church of Christ (part of what many are now calling "Sons of Hell" and "Stalkers for Jesus") is not exempt. This photo was taken inside Martinsville Church of Christ's sanctuary. That's Johnny Robertson himself in the left of the picture, and fellow cultist/stalker (and partner with recently found-guilty criminal trespasser Micah Robertson) Mark McMinnis in the plaid shirt sitting down. Have you spotted it yet? Is your "Spider-Sense" tingling? Well if not, behold true believers! I count at least nine and possibly more Spider-Man comic books sitting in a pile on the pews of Martinsville Church of Christ. The headquarters of the cult that puts out What Does The Bible Say?, A Word From The Lord and Religious Review on WGSR: live TV broadcasts where Robertson and his cronies do nothing but condemn everyone else for such imagined slights and sins as having church car washes and bake sales, instrumental music and books during church worship that aren't the Bible. Yet there it is, most presumably during a worship service at Martinsville Church of Christ: a heap of Marvel Comics and within arm's reach of its head magus. And not only that but Marvel Comics featuring Spider-Man: a character whose fathers include two Jewish comic book legends (Stan Lee and Jack Kirby)! I could also note that Spidey's co-creator Steve Ditko also created Doctor Strange and worked on the New Gods at DC for awhile, so it could be argued that Johnny Robertson is also allowing "eastern religions" and pagan worship inside as he puts it "the church that you read about in the Bible". Johnny Robertson you damn hypocrite: sit down and SHUT UP, sir! And you thought it was bad enough that Robertson gets the Bible all twisted and convoluted. Lord only knows how he would interpret the X-Men books. But as one trusted associate put it when I showed this photo to him: "Of course, I did wonder if comic books is where Johnny Robertson gets his theology from." Feel free to post whatever clever and snide captions and comments you can think of! Mark hung on every word from his leader as Johnny explained the origin of Doctor Octopus. Johnny Robertson IS a comic book character. What would Paul say about this affront to God? Has Johnny not a house to read his comic books in? Or does he despise the church of God and shame them that have no comic books? What shall Paul say to Johnny? Shall Paul praise Johnny in this? Paul praises Johnny not! That photo d-e-s-t-r-o-y-s everything that Johnny, James, Mark and Micah have put on television and in their behavior with others. The Churches Of Christ they lead has built itself up as saved by its own works and damning everyone to hell that fails to follow their exact pattern. It is extremist legalism that they follow. Johnny and gang don't follow Christ. They follow CENI instead: Command, Example, Necessary Inference. According to them if ANYTHING deviates from the set pattern of the New Testament then the Lord is not pleased and thus that church isn't a real church at all. It is thus apostate and teaching false doctrine. If it isn't explicitly named in the New Testament then it isn't to be in the churches or in worship according to Johnny. Johnny and his followers damn every other church for what clear-minded Christians know are not sinful. Instrumental music and open communion and fellowship halls with kitchens and car washes. 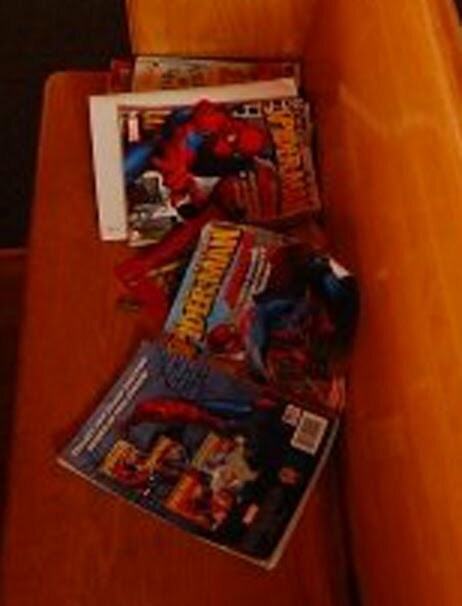 But Johnny lets comic books be left around in his own church during worship. 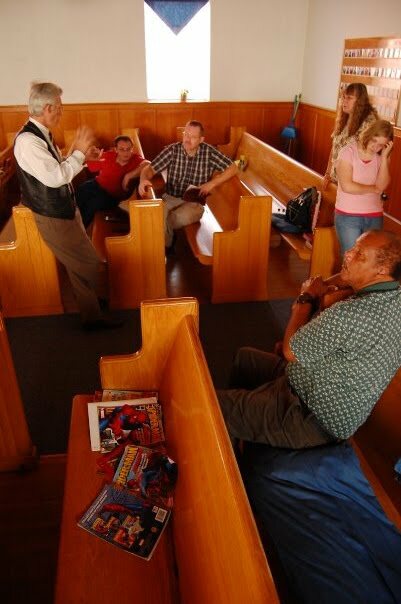 Does anyone think Johnny WOULDNT damn another church if it had comic books in the pews during meeting for worship? Johnny would go to that same verse in 1 Corinthians and use that to found his condemnation of that church. This picture shows them better than most anything else that Johnny Robertson and HIS Church of Christ are HYPOCRITES! Johnny Robertson, the Joker of Henry County. I have watched Johnny and James judge and condemn others for far less than this. By their own standard they should likewise be judged. This is kind of 'freudian' in where he is like a comic (ultra-sensationalist) himself as someone else has wisely mentioned. But also how he spreads a 'web' of deceit among his listeners. Just sayin! After all the things he has condemned others for having in churches, old Johnny gets caught with stacks of comic books on the pew? Too funny. My compliments to whomever got this picture. Where in the Bible does it authorize comic books in the church Johnny? It was then that Johnny realized that he had accidentally picked up Cable 18's news scripts for the day and left Charles with nothing to do for "news" that day. I'm surprised nobody has mentioned just how unhappy everyone in that picture looks. This guy is a nut. This is the funniest thing I have seen in a long long time. Spider Man books where one would expect to see hymn books. Exactly which scripture in the Bible authorizes Comic Books used in worshiping God. I wonder if God made a choice would he choose string instruments or comic books to be in his church? Micah said he cannot go back to Harris Nursery the place where he used to work. He was chasing down that guy that took him there at the nursery.